If you had to sum up the history of the contemporary motorcycle in a single model, the Honda 750 would be the ideal candidate. Still passing through a long period of crisis, most motorcycle factories around the world were in desperate straits, only surviving by face-lifting their old models. The Japanese, on the other hand, continued their irresistible expansion with a clearly defined marketing strategy, the will to succeed, and ample means to invest, which brought rich returns. 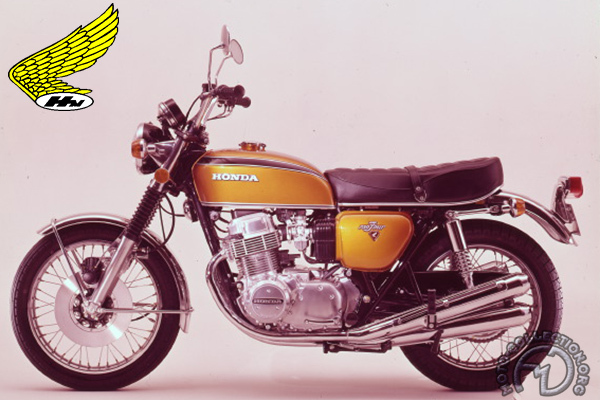 Soichiro Honda's stroke of genius was this fabulous 750, though its launch in 1968 was in fact an immense gamble. The utility motorcycle was in the process of disappearing, supplanted by increasingly affordable automobiles. Sports motorcycles, which only appealed to an elite clique of enthusiasts, represented a rapidly-shrinking sector with an often negative image. Unfazed, Honda applied the latest technology to invent a new style: the leisure motorcycle. Ignoring the diehards, the 750 Honda had all the right features to attract a wider public who wanted to get away from it all. Four cylinders gave the 750 a macho image yet it was a clean, reliable, enjoyable motorcycle. Its success was unprecedented, from the KO to the single-overhead-camshaft version, the F2 of 1978. The 1972 version of the K2, recognizable by a panel of warning lights behind the speed and tachometer dials, was followed some three years by the K6. Four cylinders and a disk brake: it was a formula that would revolutinize the motorcycling world.